Lately I’ve felt a little … curmudgeonly. Perhaps it has something to do with the spring equinox. Or maybe it’s the proximity of this weekend’s Masters Tournament (once again, my invitation to Augusta appears to be lost in the mail). Regardless, I hoped a little research into the history of the Bowl Championship Series (BCS) and the College Football Playoff (CFP) might cheer me up. 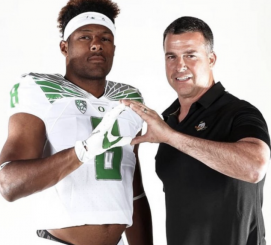 My quest: to unite with the true believers, those glad-handy high-fivers who view our 9-4 record as a harbinger of future fortunes under Coach Mario Cristobal — fortunes squandered by Peter-Principled Mark Helfrich and One-And-Done Willie Taggart (I believe, but cannot prove, that Taggart told the United Van Line guys to unpack the essentials and “keep ‘er runnin”). Some good, honest college football research to deliver me from the glass-half-empty curmudgeon crowd to the much better looking glass-half-full jet set. Spoiler alert: no such luck. How great would it be to get back on this stage? Bill Hancock, “Mouthpiece” Mullens and the other Gurus of the Grapevine would have us believe that at the inception of the 2019 college football (CFB) season, 130 teams will stand poised to battle for one of the Final Four Golden Tickets: a trip to the College Football Playoff. Can we agree that the Group of Five (G5) teams that populate the American Athletic Conference, Conference USA, the Mid-American Conference, the Mountain West Conference and the Sun Belt Conference are but window dressing? The G5 schools are CFP-eligible only to keep the politicians — local, state and federal — off of Billy’s back and the backs of the Power 5 Conferences (P5). 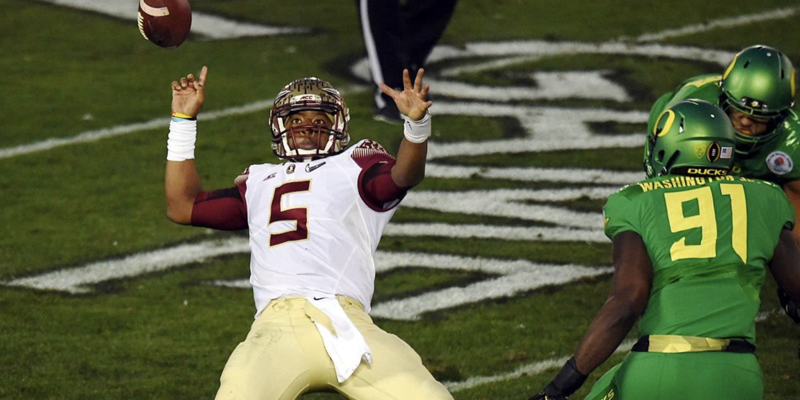 Sorry, but an undefeated UCF is not taking a spot from even a two-loss SEC champion. Unless the CFP field expands to eight, with an automatic G5 qualifier, none of the 59 G5 teams will ever, ever get its hands on a Golden Ticket. So that leaves 65 Power 5 teams and six independents — 71 teams — with legit shots to make the CFP, right? 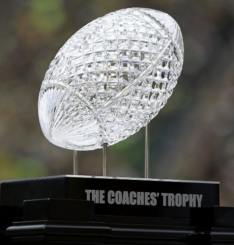 Can we admit the BCS’ s trophy was much better? The 16 BCS Championship games from 1998 through 2013 provided room for 32 teams to play for a title. However, only 15 teams actually made the grade: Alabama, Auburn, Florida, Florida State, LSU, Miami, Nebraska, Notre Dame, Ohio State, Oklahoma, Oregon, Tennessee, Texas, USC and Virginia Tech. 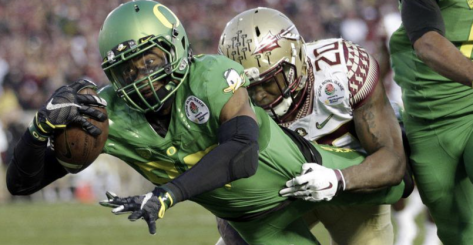 Beginning in 2014, the CFP established a four-team field. This expansion opened the door to a CFP championship to twice as many teams, right? Four years of the CFP, and we add but four teams to the list: Clemson, Georgia, Michigan State and some school to the north of Oregon. Over 20 seasons, only 19 teams have appeared in a Division I college football championship game. Let’s take a look at those 19. Only two of them did not finish in the top-tier of recruiting rankings. One of them was our Ducks, who rode a transcendent offense and Heisman-winning QB into both the BCS and the CFP national title games. The other outlier is Virginia Tech, which had its own transcendent talent in Michael Vick. Neither won a championship. There are other teams that had a legitimate competitive shot. Oklahoma State in 2011, Baylor or TCU in 2014, Stanford in 2015, Penn State in 2016 and Ohio State in 2018 come to mind. These teams were excluded due to a second defeat or being a perceived “lesser team,” often playing an easier schedule. Tip: if you are going to have but a single loss, do not get destroyed by a lesser opponent. Right, Buckeyes? So long as recruiting remains the driving force in CFB on-field performance, the Grapevine Gurus see a second loss as the CFP kiss of death. As long as these pigskin mystics continue to conjure up strength-of-schedule and other criteria on the go, don’t expect many more teams to join the club. So what does this mean for our Ducks? Well, even I have to admit the 2019 recruiting class is a glass more than half full. With the Ducks having arguably the best roster in the Pac-12, I’m seeing a 10-2 record and a Pac-12 conference championship appearance. Surely, this means a Golden Ticket, right? What else did you expect from a curmudgeon? Phil Anderson, the FishDuck.com Volunteer editor for this article, is a trial lawyer in Bend Oregon.